After a 3 day stopover at Raffles Hotel in Singapore, my American girlfriend and I went on to Bali. This blog is not about Raffles Hotel, but I just have to compliment this hotel. I have stayed at tons of hotels, but this is just in a league of its own. You don't stay at Raffles - you live there ........... it is absolutely worth a trip to Singapore alone. In Bali we stayed at Grand Hyatt in a "club" room ....... the extra price of the club room was a good deal, because every day they had happy hour where we would get snacks and free drinks for one hour. I think it was from 18:00 - 19:00. And every day we sat in the lounge enjoying whatever drink we wanted. 2 days before I climbed Mount Agung we climbed a small mountain together where we at the top had a nice break and got something to eat. When we got back I asked at the tourist information desk at the hotel what other mountains I could climb and they suggested a popular mountain, but I asked "which one is the highest mountain in Bali ?" ......... and found out that it was possible to climb it. I got the description and went back to look at it, and later the same day I booked this trip. I was going to picked up a little before midnight 2 days later, and we would climb the mountain in the middle of the night to see the sunrise at the mountaintop. 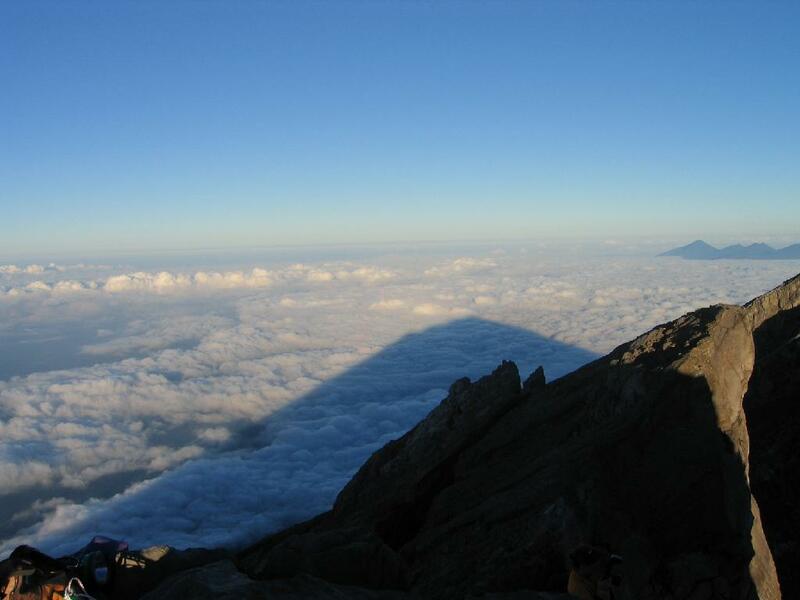 Mount Agung is a volcano which has not been active since the 60's .......... look here for description Mount Agung Bali. That was all the information I got. On the same day as the climb we went to our happy hour for the usual cocktails - and we sat and enjoyed our drinks together with some other guests that we had gotten to know. After one or two drinks I told our newfound friends that I better go to bed now, because I am going to climb a mountain at midnight ......... they all look at me with big surprise and one turned toward me and said .... WHAT ??? He asked me if I had prepared for this climb, and honestly I just said 'no' ......... but that I look forward to do it, and that I think it sounds exciting, my girlfriend is also there of course and I think she thinks I am a little crazy, she would much rather be laying on the beach and enjoying the sun. He was/is the general manager of the hotel's food division, and he asked me where I booked it, and he looked a little shocked to find out that the information desk would just sent untrained guests up this mountain. He had tried it a few years ago and he told us, that he had to sit in a wheelchair for the following 2 weeks ....... even though he had prepared for it. And that he knew of guests that had called for help to be air lifted out because they were too scared to climb down. The truth is, that I really wasn't prepared for this at all ........ when we left Denmark (where we live), we didn't know that there were "big" mountains on Bali. However all the talk didn't scare me, and I go to my room at apx. 8 pm. to sleep a few hours. I didn't really sleep ........ the adrenaline started to kick in and kept me awake. I decided this time (did you read about my trip to Borneo a few years earlier ?) to take some water, unfortunately they only had bottled water ...... IN GLASS BOTTLES, and I needed a bottle opener. As I didn't have any bag with me, I take 4 bottles of water and a Mars bar from the mini-bar and put them in a plastic bag. I didn't have any special clothes with me so I wore sneakers and some trainers and brought a sweatshirt in case of low temperature. I was picked up around midnight and we on the way to the mountain we picked up a couple from Germany ........ when they enter the car, I suddenly realize, that I should have been a little more prepared. They wore mountain boots, hats and gloves etc, and they have climbing experiences from mountains in the Soviet Union. I got back to the hotel at noon and slept for a few hours before I went bike riding with my girlfriend. 1 - The Internet is like alcohol in some sense. It accentuates what you would do anyway. If you want to be a loner, you can be more alone. If you want to connect, it makes it easier to connect. 3 - Some genuinely great information, Glad I discovered this. Good teaching is onefourth preparation and threefourths theater. by Gail. 4 - At this time it seems like Movable Type is the best blogging platform available right now. from what I've read Is that what you are using on your blog? 5 - You really make it seem so easy with your presentation but I find this topic to be really something which I think I would never understand. It seems too complicated and extremely broad for me. I'm looking forward for your next post, I'll try to get the hang of it! 6 - This is really attentiongrabbing, You're a very professional blogger. I have joined your rss feed and sit up for in search of extra of your fantastic post. Also, I have shared your site in my social networks! 8 - Hello, I desire to subscribe for this blog to obtain most recent updates, thus where can i do it please help. 10 - Enjoyed studying this, very good stuff, regards . A man may learn wisdom even from a foe. by Aristophanes. 12 - Its like you read my mind! You seem to know so much about this, like you wrote the book in it or something. I think that you could do with a few pics to drive the message home a little bit, but other than that, this is great blog. An excellent read. I will certainly be back. 13 - I will immediately clutch your rss feed as I can not to find your email subscription link or enewsletter service. Do you have any? Please let me know in order that I may just subscribe. Thanks. 15 - I will immediately grab your rss feed as I can not find your email subscription link or enewsletter service. Do you have any? Kindly let me know so that I could subscribe. Thanks. 16 - Hello, i think that i saw you visited my blog thus i got here to return the choose.I am trying to to find issues to enhance my site!I guess its adequate to use a few of your ideas! !